The exhibition Der Unterschied liegt in der Differenz presents the work of five artists whose work draws on specific styles or quotes, reflects, interprets, and caricatures well-know works of art. Oliver Kossack's painting Der Unterschied liegt in der Differenz (2010) lends the exhibition its title. In his installations and paintings Kossack consciously plays with different styles and discourses, which he adapts and stylizes as post-modern works; he also satirizes the icons of his reference sources, as in the work Unready-Made. In his mostly large-format works Kossack uses different materials and processes, which imbue his imagery with a special brand of humor, not least through the integration of text fragments and the pointed titles of the works. Klaus Kamptner also borrows images from popular culture and art history, which he then undermines in his small-format paintings. In a manner recalling the medieval German prankster Till Eulenspiegel, Kamptner inverts motifs and genres. 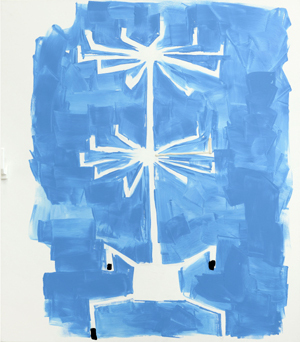 His painting Trees Down, a commentary on abstract color field painting, shows three upside-down trees in front of a two-tone monochrome background as a lampoon of a heroic legacy. Sebastian M. Kretzschmar, Kilian Schellbach, and Jan Thomaneck have been working together as the artist group Famed since 2003. In its installations the group addresses fundamental questions of artistic production and its representation. The video installation Untitled (Home) plays with the expectations of the viewer, who is formally lured into a trap. What first appears as a meaningless projection of black film on a black surface is momentarily transformed into a movie scene by the glare of headlines and the sound of an oncoming car. One of Henriette Grahnert's most recent "writing paintings" bears the phrase My inner Beauty may speak to you, which, painted in oil, refers to the "inherent values" of her paintings, although the appearance of the work consciously draws on an advertising aesthetic. In a sense, the picture thus advertises itself-as characteristic of Grahnert's approach of repeatedly challenging the viewer by her ambivalent interplay of different materials. This also applies to Grahnert's objects, such as her laconically titled Archi Poveri (Triumphal Arch for the Poor), made from plastic and iron and inviting the viewer to walk through. Claudia Angelmaier's photographic works probe their medium. In picture of a pin pong ball the artist turns a photocopy of a ping pong ball into a romantic landscape illuminated by the light of the moon and thus takes the reproductive nature of the photography to the point of absurdity. All works shown in the exhibition-paintings, installations, photography, and objects-have a precisely calculated ambiguity. Nothing is as it appears.